China has issued three policy papers on the European Union, in 2003, 2014, and most recently in late December 2018. They were produced by the Chinese government with the aim of setting the direction and principles of China’s relations with the EU and its member states. The premise of the policy papers has largely remained the same: The global trend is towards multi-polarity and economic globalization, and both China and the EU contribute to this trend. All of the papers emphasize the importance of the UN, the non-proliferation regime, ASEM, combating climate change, and counter-terrorism cooperation. In the light of the policy papers, the EU’s importance as an economic and a technological cooperation partner for China has increased over the years. The areas of cooperation have grown steadily between China and the EU, and the latest paper contains an impressive list of cooperation mechanisms and dialogues, including new areas such as space and oceans. All of the papers also share the view that “China and the EU have no fundamental conflicts of interest, and have more agreement than differences”. However, the situation seems to have changed for the worse since 2003, when the policy paper stated that “China-EU relations are better than at any time in history”. The fact that relations have not improved since is manifested in the repeated attention in all three papers to some contagious issues, such as the EU arms embargo. The 2018 policy paper contains much tougher language on several issues. This is at least in part a reflection of China’s strengthening great power identity during Xi Jinping’s era. Something quite new in the 2018 paper is the explicit praise given to Xi Jinping and his international relations ideals. The Taiwan Issue is given a prominent position in all of the papers. 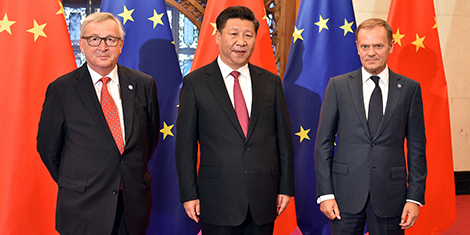 According to the 2003 and 2014 documents, “China appreciates the EU and its members’ commitment to the One China principle”, but in the latest formulation, China “proposes” that the EU “adheres” to the said principle. The 2018 paper issues a demand: “The EU should explicitly oppose” Taiwan independence. It furthermore states: “Honouring the commitment to respecting China’s sovereignty and territorial integrity, upholding the One China principle with concrete actions, and respecting China’s core interests and major concerns bear on the long-term stability and growth of China-EU relations”. It needs to be noted here that the EU does not abide by the “One China principle”. Instead, the Union and its member states are committed to upholding the One China policy. The EU recognizes the government of the People’s Republic of China as the sole legal government of China. At the same time, it insists that any arrangement between the two sides of the Taiwan Strait can only be achieved on a mutually acceptable basis, “with reference also to the wishes of the Taiwanese population”, as formulated by the European Union External Action Service in May 2016. Both the 2003 and 2014 papers mention Tibet, Hong Kong and Macao, but the language has become less ambiguous with each version. With regard to Tibet, the earliest text “requests the EU side not to have any contact with the ‘Tibetan government in exile’”. In the 2018 version, China “appreciates the position of the EU … that recognizes Tibet as an integral part of China’s territory” and calls for the EU not to allow “leaders of the Dalai group” to visit the EU or its member states. In addition, the 2018 paper – for the first time – demands that the EU should not interfere in the affairs of Hong Kong and Macao, and also adds Xinjiang to the list of concerns: “It is also imperative that the EU side does not support or facilitate the East Turkestan Islamic Movement”. In this regard, the EU indeed recognizes Tibet and Xinjiang as parts of China, but remains concerned about the protection of the rights of the minority nationalities living in those regions. The 14th Dalai Lama is regarded as a spiritual leader of the Tibetans and has been received in many EU member states at a political level, including Finland. Furthermore, the EU calls for China to fully apply the “one country, two systems” principle in Hong Kong and Macao. Human rights have always caused friction in Sino-European relations, but the 2018 policy paper indicates that China’s tolerance is wearing thin. This does not bode well for the judicial cooperation between the EU member states and China, something that Finland has considered a uniquely valuable asset in its bilateral relations with the country. The 2014 paper maintained that “China will continue to implement the China-EU legal and judicial cooperation programme … on the basis of equality, mutual respect and non-interference in internal affairs”. The 2018 paper does not mention judicial cooperation, only the high-level China-EU Legal Affairs Dialogue, and states: “The European side should … refrain from interfering in China’s internal affairs and judicial sovereignty in the name of human rights”. The 2018 paper mentions China’s cooperation with the Central and Eastern European countries, welcoming the support of the EU. With such a formulation, China makes a mockery of the fact that this 16+1 cooperation has been under critical scrutiny by the EU Commission. In what can only be regarded as an arrogant counter-attack on the urgent concerns about the rights of European citizens in China, the 2018 paper “hopes the EU side will earnestly protect the safety and legitimate rights and interests of Chinese nationals in its member states”. In the face of such assertiveness, Europe would do well to remain calm and stay the course. Jyrki Kallio is a Senior Research Fellow in the Global Security Research Programme at the Finnish Institute of International Affairs.